This amateur production of ?Visitors? is presented by special arrangement with SAMUEL FRENCH, LTD. In a farmhouse at the edge of Salisbury Plain, a family is falling apart. Stephen can’t afford to put his mother into care; Arthur can’t afford to stop working and look after his wife. When a young stranger with blue hair moves in to care for Edie as her mind unravels, the family are forced to ask: are we living the way we wanted? 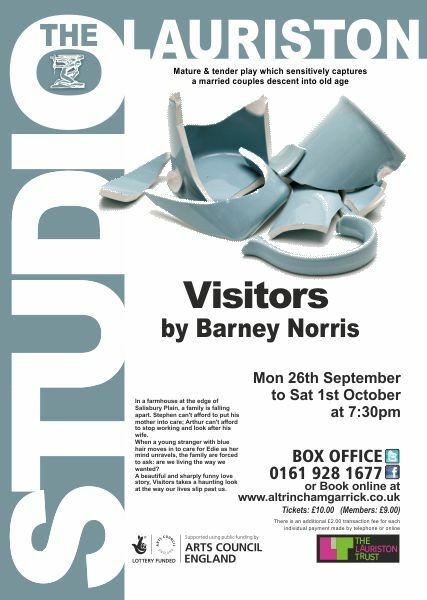 A beautiful and sharply funny love story, Visitors takes a haunting look at the way our lives slip past us. MANY plays are about illicit affairs, but not Visitors by Barney Norris. His first full length play is about a married couple who have stuck together for 40 years. During that time Edie and Arthur have lived a contented routine existence in the same farmhouse. Their life begins to change when Edie shows early stages of dementia. Their son, Stephen, who is not particularly close, has arranged for Kate to move in as their carer. This production, expertly directed by Bill Platt, illustrates the problems of growing old and its effect on families. The pace is gentle. The conversation comes from the couple sitting in the comfortable easy chairs where they have always sat. The role of Edie played by Janet Slade sends lumps to the throat. She illustrates well the slow decline of a loyal wife as her faculties slowly go, leading to a sad ending. She adds gentle humour to the production. Stephen Moss?s Arthur is the rock which has held together this long lasting marriage but even he shows signs of cracks. Stephen plays him as a steady stalwart who can?t really accept this wife?s changing character. Another good performance comes from Andrew Higson as Stephen, the not especially devoted son with his own marital problems. He gets the relationship between him and his parents exactly right. Kate the newest character to invade their peace, is acted by Rachel Isbister as comparatively lively but she is a round peg in the square hole. You will smile a little quite a lot, but at the end, you might find yourself wiping away a tear.